I feel like a terrible person. Dennis did something super nice and it got left beside the scanner at work and wasn’t rediscovered until today. We recently moved office suites (in the same building, just down the hall) and it’s been a solid two weeks and most everything is still in boxes. Dennis, in his awesomeness, sent some “Christmas Cards” to folks he traded with this year (which is an awesome idea) and I was one of those lucky people. Our original trade was awesome enough, but Dennis went out of his way to spread a little Christmas cheer. 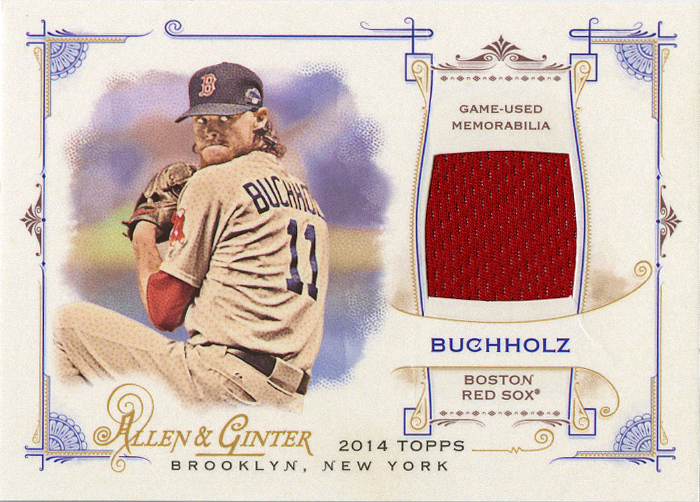 A beautiful red Ginter relic of Clay Buchholz, one of my favorite pitchers. Thank you so much Dennis! I know it’s terribly late to say that, but it was incredibly nice and very much appreciated. It, and the scanner, just got lost in the shuffle for a little while. If any of you haven’t traded with Dennis before, I highly recommend it.